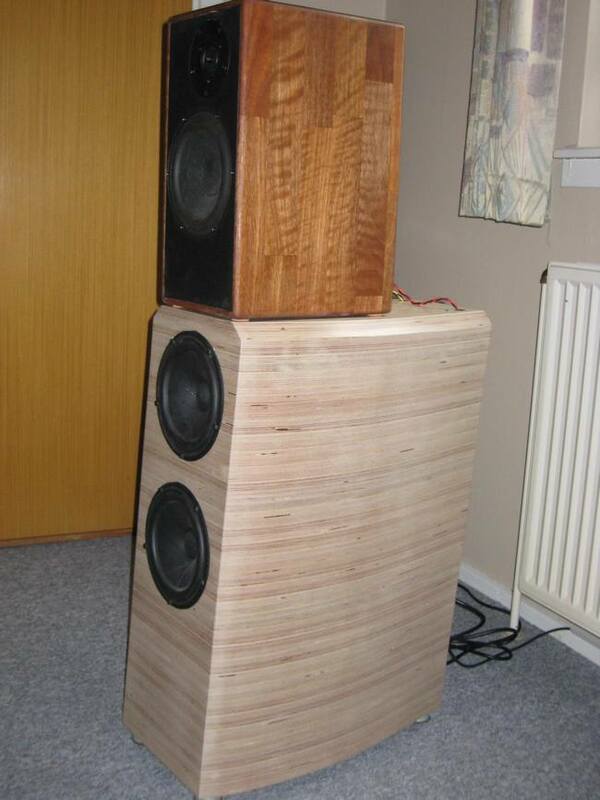 Claus' DIY project is planned to be a two box combination with 2 pcs ScanSpeak 18W/8531 in the bass enclosure of 42 litres tuned to 33-34Hz with the port in the bottom. This enclosure also holds the Coolback II 600 in a separate chamber in the back. 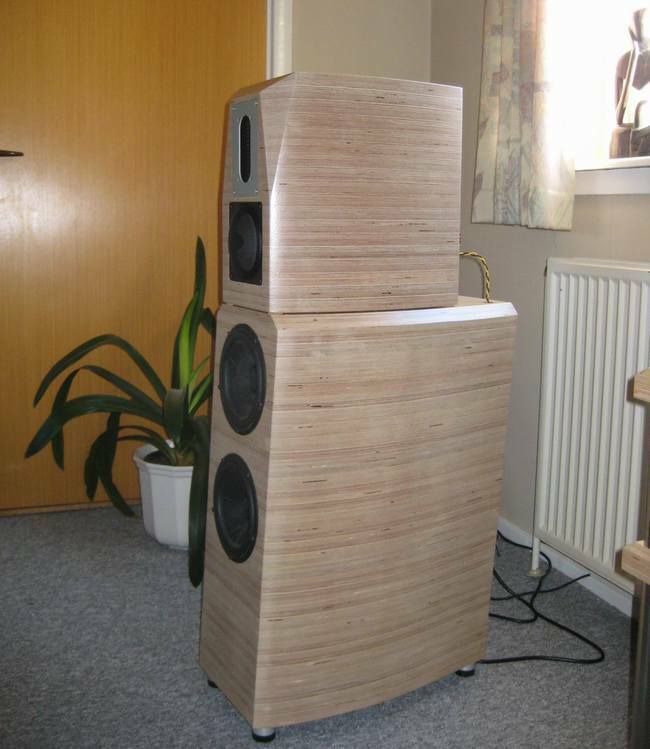 The top enclosure will be Mundorf AMT2510 tweeter and Accuton C90-6-078 midrange - two very expensive and capable drivers. 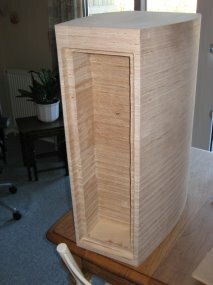 The bass enclosure is made up of 32 layers of 21mm birch plywood. 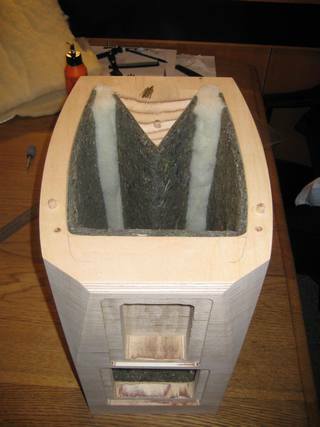 At this picture you can see the separate chamber for the Coolback II 600 in the back of the bass enclosure. A multiple sandwich plywood enclosure will be very ridged and very beautiful to look at, but it a lot of work, time consuming and expensive. I can only say: "Wauw - Excellent job, Claus"
Claus is using his old CSM Mini Monitor as a temporary solution for the top. 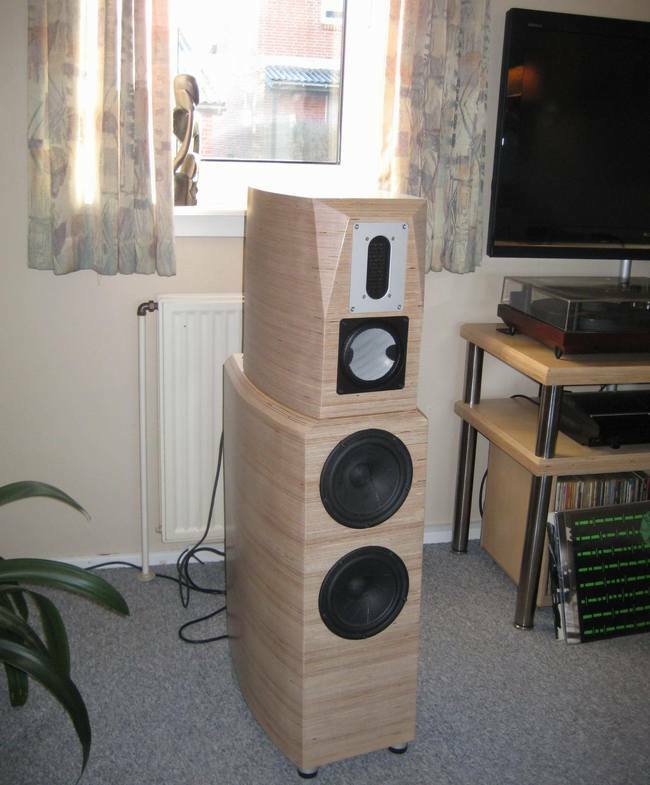 "About the sound - it's much better than I would have thought because I haven't made any measurements yet and only tuned the system by ear...! I have made crossover points at 350Hz and 3kHz with 4th order Linkwitz Riley and made some equalizing around 50-60Hz -3dB and also some damping of the tweeter. As source I use my integrated amplifier Musical Fidelity A5 as preamplifier and Musical Fidelity A5 CD-player. The records are played on an Alphason Sonata with HR100MCS arm and Dynavector 10X5 cartridge"
My immediate impression is that the sound is more dynamic - in the sense that the grip on the woofer is superb and the transient response in the music generally seems less compressed and power will never be a problem. 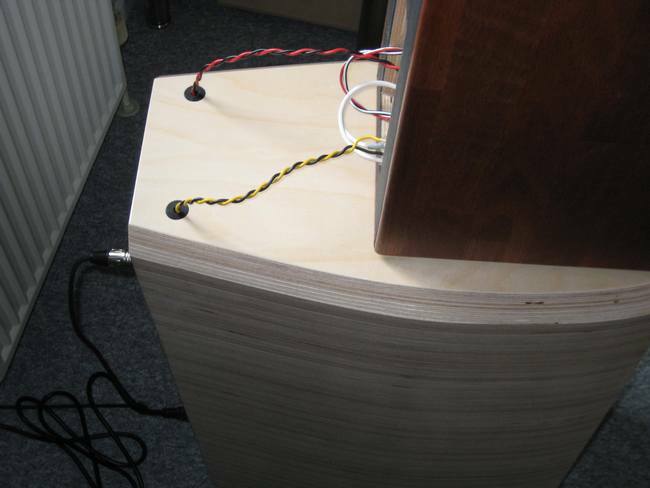 I have no doubt about whether I am playing CD or record-player, so all in all, the results exceeded all expectations"
"There is NO doubt that I have to make measurements when the system is finished. The digital crossover is indeed a wonderland for fiddle-fingers (there are more combinations than the lottery). So measurements are a must"
"At last" Claus says - he have finish his loudspeaker project and I got some very nice pictures of the finished speakers. 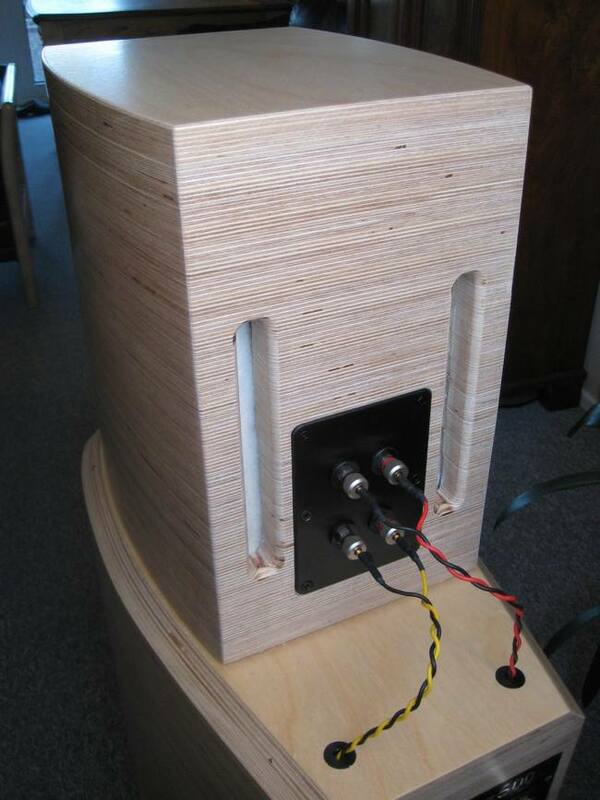 As mentioned earlier the Top enclosure will house a Mundorf AMT 2510 tweeter and Accuton C90-6-078 mid-range. The Top box is as designing an aperiodic enclosure inspired by Troels Gravesen's "Cyclops" - which attempt to minimize reflection at the back of the mid-range membrane. 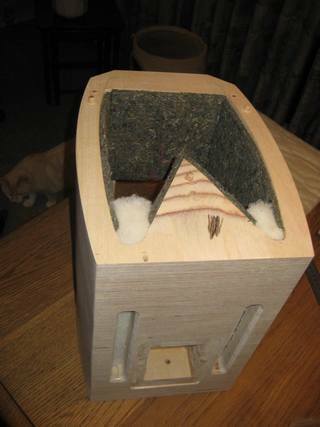 The Tops are made the same way as the Bass boxes - multiple sandwich birch plywood. 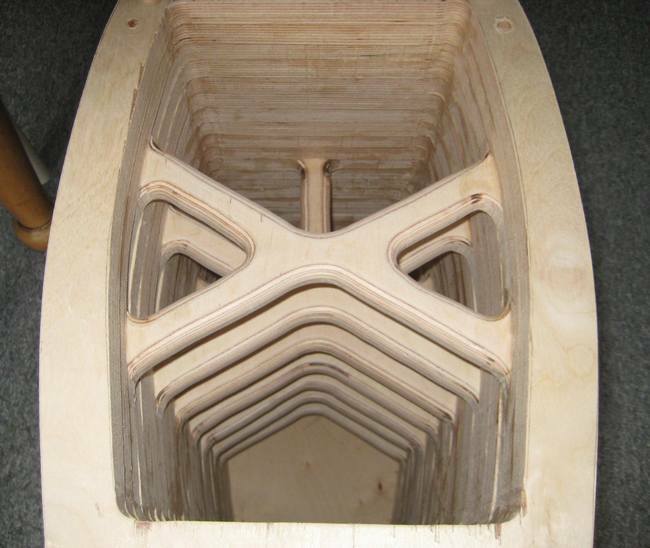 A view of back of the damped vented top enclosures. 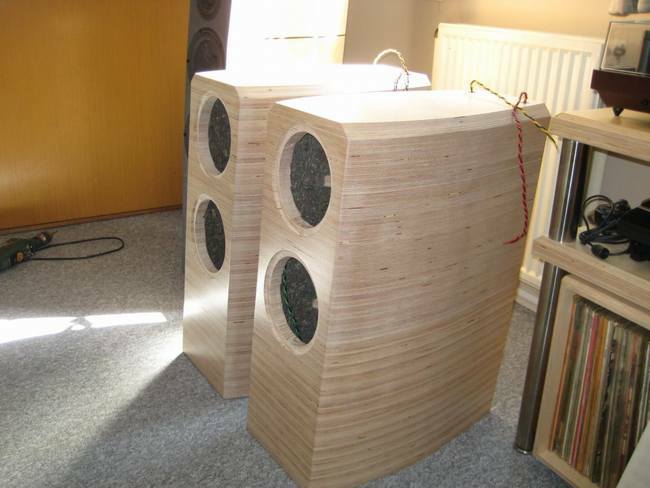 You will have tough job to find manufactured full-active loudspeakers as nice as these Do It Yourself loudspeakers !!! 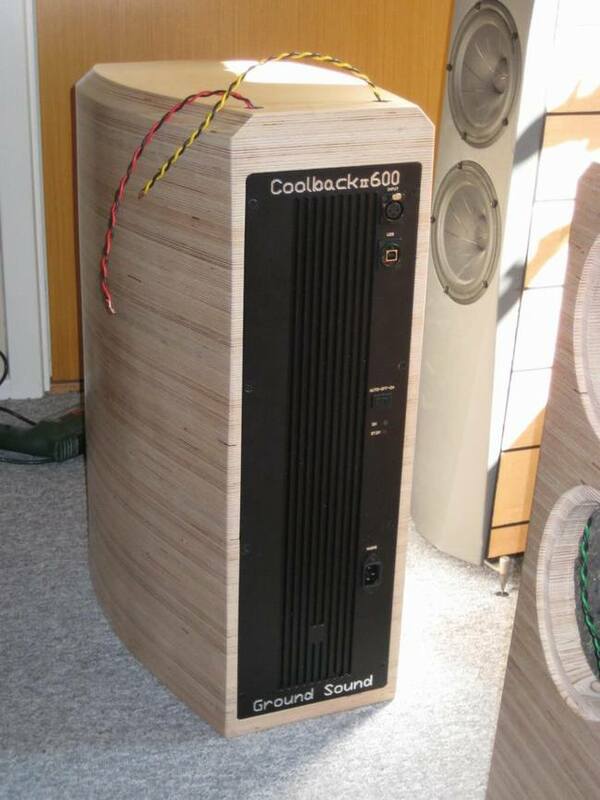 "Now that I have choosen to use some of the markets perhaps the most revealing drivers - I just have to note that the Coolback II 600 just does it's job and plays music"